So… do those marketers have a reasonable concern? A study from a MailChimp employee, who looked at 1.5 billion emails, seems to confirm this. According to the figures released, open rates have been lower 3 consecutive weeks after Gmail introduced the new inbox compared to 15 weeks before, suggesting a huge impact! However, I have my doubts. I asked the newsletter subscribers of this blog what they think: Will tabs make emails to Gmail users less efficient? Their answers have been somewhat divided – 3:2 no:yes. There’s no clear majority. The list grew nicely. Each month had a larger rectangle area than the preceding one. Gmail is by far the most important mail provider. 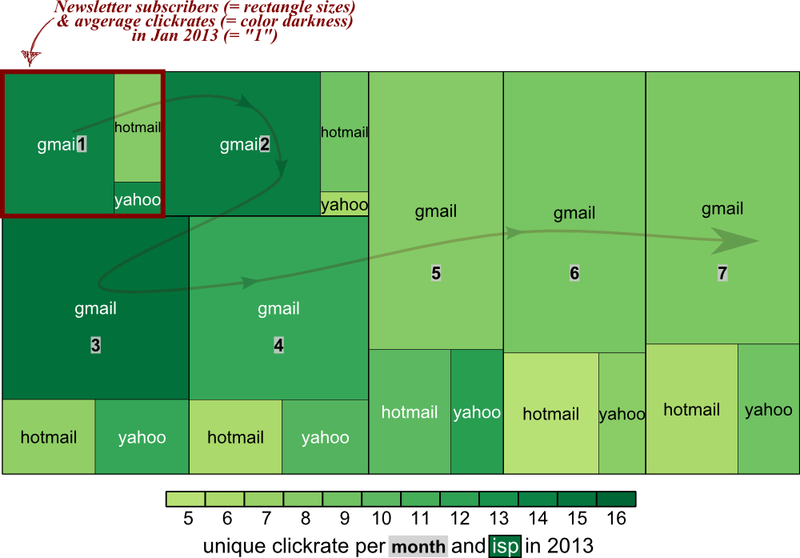 However, click rates dropped, as indicated by the lighter green to the right. 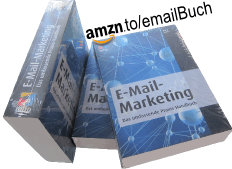 The decrease from January to July affects all three email providers. 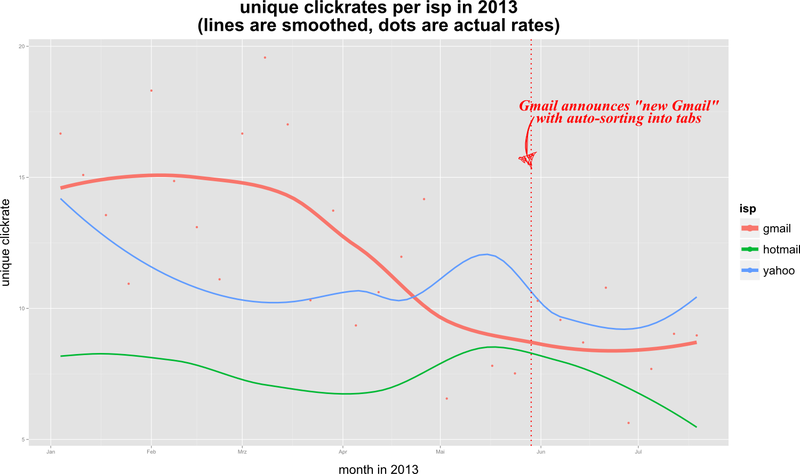 The sprinkled red dots represent the actual Gmail click rates. As you can see, there is much variance in the data. Unique click rates ranged from 5.63% to 19.57%. It’s all just the regular newsletter, which goes out every Friday (subscribe). Afaik, Gmail classifies it as promotional, although it doesn’t promote any business. The new tabbed Gmail is there and we got to deal with it. It’s not clear, yet, if it impacts response rates negatively in the long run. So far, so good. However, one should monitor the numbers. Instead of relying on aggregated benchmarks from third parties, better look into your own data. Do they reveal problems, like transactional emails that are misclassified as promotions? Then try letting your subscribers move those messages to their primary tab. A good starting point would be the segment of your most engaged gmail users. If you get those fans of yours to report the misclassification to Gmail, maybe the model adapts and applies a correction to all emails? One can only speculate. But it’s worth a try. What has your tabbed-Gmail experience been so far? I’m curious. This entry was posted in english and tagged clickrate, gmail. Bookmark the permalink.